The Lely Weeder is a Blind Cultivator and can be adjusted to be used as a between row cultivator as well. The 6mm tines are set 1 1/2" apart across the entire width of the bed and float independently. It can be used as a blind cultivator with all the tines down until the crop is 3" - 8" tall, then the tines over the row can be raised and the cultivator used as a between row cultivator. The depth of each tine can be adjusted. 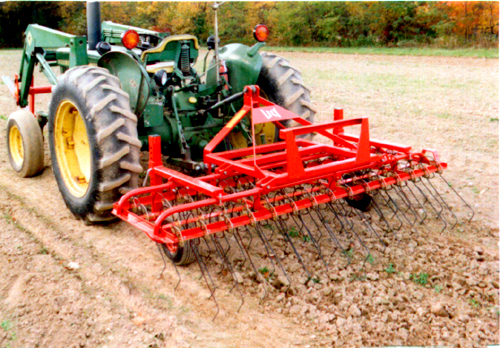 Optional gauge wheels help control the depth of the cultivator and act as parking stands. It can be used in clay or sandy soils and works around rocks better than other blind cultivators. Imported from Holland.